wanderlust ATLANTA: Who ya gonna call? Ghostbusters! In 1984, on everyone's lips was, "Who ya gonna call? Ghostbusters!" It was the same last night. 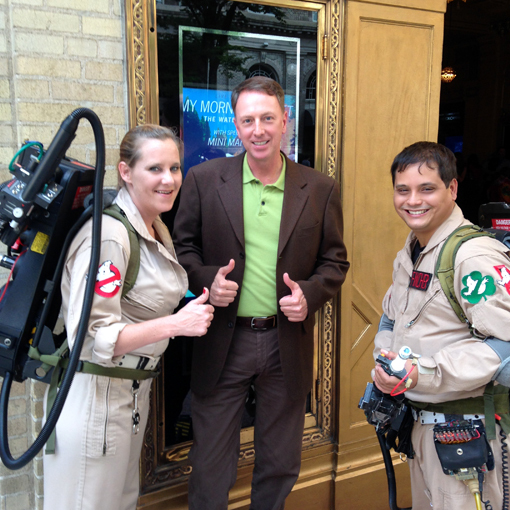 Part of this year's Coca-Cola Summer Film Festival at the Fox Theatre, I just saw Ghostbusters! Awesome, awesome time! Even as I was walking up to the Fox, I heard from across the street, "Travis!" I turned around and from her car my friend Jan yells, "Who ya gonna call?!" I already knew it was going to be a fun night, but that totally set the tone for a definite fun night! Adding to the festivity, there were quite a few members of Georgia Ghostbusters in attendance...in costume! It totally made the whole experience all the more exciting. They graciously posed for photos for me and my friend Perry, and immediately we checked-in at the Fox on Facebook (of course we did). I'm totally looking forward to seeing Georgia Ghostbusters again at Dragon Con! As you can see, I wore my slime green shirt for the occasion! I only told a few people that it was pure happenstance, due to the fact that my pressed shirts were at the cleaners and I didn't want to iron that morning. Thank you, my friend, Serendipity! One of the things that I love most about seeing a classic film with a large crowd is the mutual understanding—and the collective laughter—of punch lines, oftentimes with a more grown-up understanding making them even funnier than they ever were before...particularly the jokes about politicians, which are timeless. Sorry to my friends who are elected officials, but even you get it. The Fox has such great fun with their film series. Coming up soon they'll be screening "Braveheart", starring Mel Gibson. Although perhaps best-known for Mad Max, one of the first films I saw Mel Gibson in was the 1979 "Tim", which of course I saw many years later, because I'm so young. He won an Australian "Best Actor" award for it, which as I recall was very deserving. For Braveheart, the Fox is hosting a costume contest AND they've partnered with local brewery Monday Night Brewing (one of my personal favorites) for a tasting event, featuring their Drafty Kilt brew. Being a Star Trek fan, my personal MNB favorite (based on name alone) is Nerd Alert...just sayin'. I've met a number of the staff, and at least one owner, at Monday Night...they're AWESOME! I highly recommend their Tour & Tasting events, and if you're visiting Atlanta, they're a very short ride from downtown. Before the movie started, they held the customary pre-show program, which includes a sing-a-long. One of this particular evening's selections was "Peachtree Street" by Frank Sinatra and Rosemary Clooney. She was a rather famous singer and actress, and you may have seen her nephew in a movie or two—George Clooney. The organist in residence at the Fox, Larry-Douglas Embury, added a line to the end of the song that speaks to seeing a show at the Fox. The audience loved it! "Strollin' along Peachtree Street, I'm as happy as can be..."
Speaking of strollin' on Peachtree Street, honoring my typical pre-Fox-show tradition, I visited Livingston Restaurant+Bar for a pre-show libation and dinner, and my friend Perry met me there (we've not attended a Fox show together since The Lion King!). I enjoyed one of my favorite dishes there, the Seasonal Roasted Beets, which is AMAZING! A visitor from London sitting a couple of seats over asked about the dish. I described it and he ordered it as well. For my main course, I enjoyed another favorite, their Shrimp & Grits—so incredibly good! That was the first time I've had their Shrimp & Grits since my excursion with Peachtree Food Tours...and it was even more delicious than I remembered! I meant to take photos of dinner, but was too distracted by the anticipation of jubilee my belly was about to experience. Did you know they're making a new Ghostbusters, with women Ghostbusters? I'm so excited and the cast is looking awesome! So far they've cast Melissa McCarthy, Kristen Wiig, Kate McKinnon and Chris Hemsworth! It's slated to premiere in July 2016. Ghostbusters was the first movie in this year's Coca-Cola Summer Film Festival I've seen, which is unfortunately almost finished. There were quite a few others I'd wanted to see (and a couple more that I want to see), but I just got busy. I need to make more time for fun. Speaking of more fun, there are still a few movie events remaining in this year's Coca-Cola Summer Film Festival. 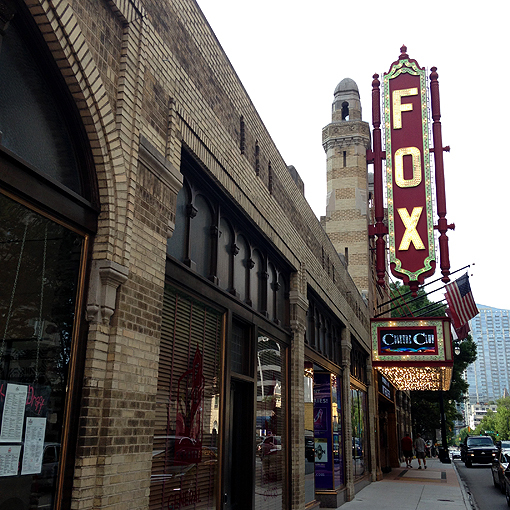 Check them out here and then go make some memories at the Fox Theatre!